Our Y-chromosome Haplotree test results for our direct Miller line shows that our Haplotree group is R1b1b2. The Y-chromosome is only passed from father to son, and because of this my Uncle, who agreed to provide his DNA for testing, and his son are the last two living people in my maternal family to have this chromosome. From the diagram shown at left, you can see the R1b sector starts in Eurasia and migrates west across Europe. You can click on the image to get a better view of the migration, indicated in brown with the R1b tags. 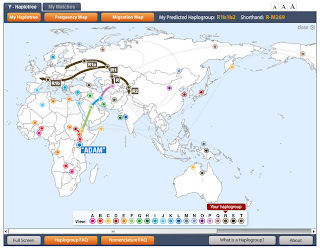 Please note that our haplogroup is R1b and is the southern of the two brown migration paths. 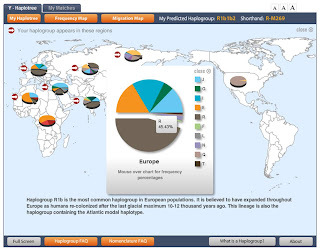 If you wish to learn more about the R1b1b2 Haplogroup you can read more here and here. All of my research (and Sheri's too) traces our family to this section of the world, so this is a great confirmation of our work. In addition, several of the exact matches have been able to trace their lineage to Ireland, Germany, England, and Italy. 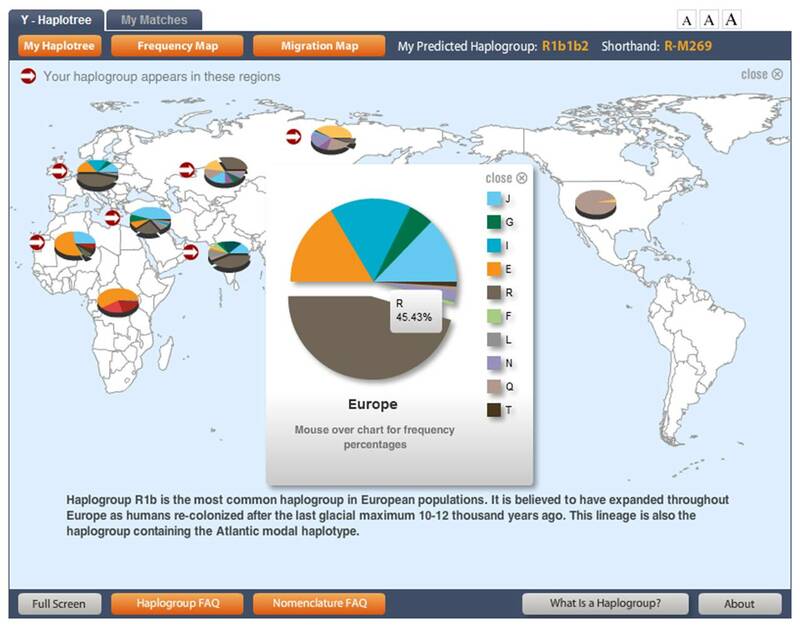 The above chart shows that there is a 45.43% frequency of this Rb1 group in Europe, making it the most common haplogroup in European populations. Please let me know if you have any questions by leaving a comment on the blog. That way, we can all know what each other is thinking. I am waiting on pins and needles for the rest of the results to come in, especially the mtDNA results. Two months is a long time to wait. 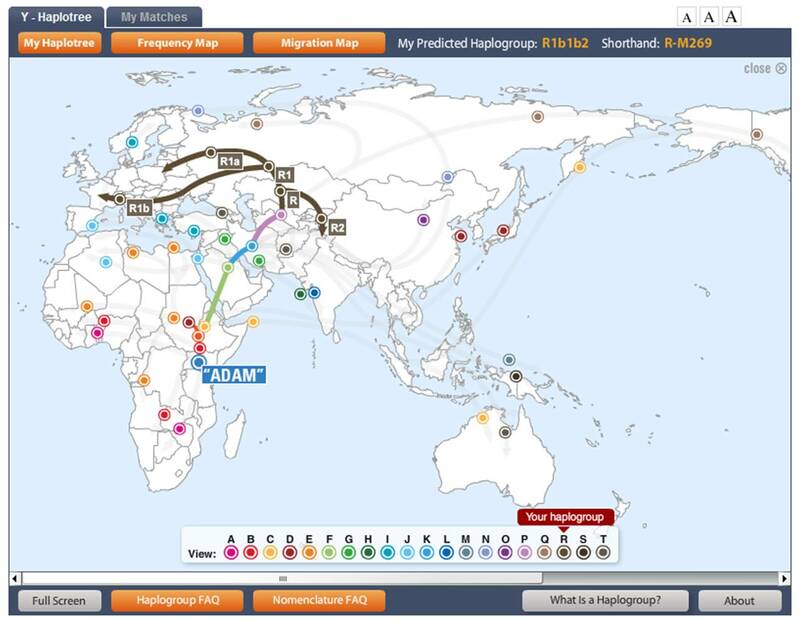 Data and charts shown are from Family Tree DNA. I am feeling overwhelmed; that I need a scientific mind to follow this train of genealogy tracking. I have a friend who when he did the testing, matched 35 markers with a totally unrelated last name. He is thinking he must have a different father. Is this really what would happen? You can tell, I am confused by how you can tell anything let alone within 9 generations.